Four hundred and fifty-nine million. That’s the number of business trips logged by Americans in 2015, according to US Travel. These trips cost businesses a total $296.3 billion. That includes expenses incurred for meetings, events, and incentives programs. And how is all this travel affecting us? According to Scott Cohen, Research Deputy Director at the University of Surrey’s School of Hospitality and Tourism Management, it’s not good. Frequent long-haul flights overexpose you to radiation. They can also heighten your risk of having a heart attack. Or contribute to deteriorating memory and faster aging. Of course, companies can’t cut business trips altogether. As technology makes the world smaller, businesses are expanding their geographic footprints. As such, they must send executives to their target regions. You need ensure that a new branch is working. You have to meet with distant clients, or negotiate partnerships on the opposite coast. You may have to travel, yes. But you don’t need to be uncomfortable. If you have to travel for work, you might as well find a way to make yourself comfortable on the trip. 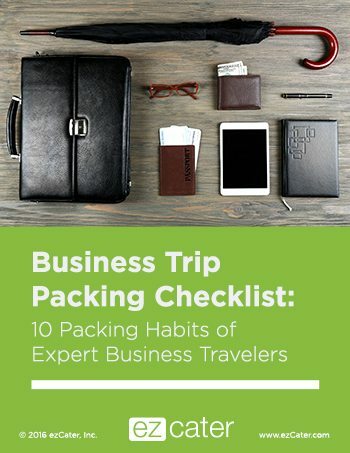 In the first part of this series, we covered packing tips for business travel. In this post, we’ll discuss how to stay comfortable once you’re on a business trip. You don’t want to be looking for a place to stay right after a long flight. If you’re attending a big convention, nearby hotels will either be booked or on surge pricing. Also, room rates increase if you book closer to the actual date of your stay. If you start researching early, you’ll have more time to find discounts and promos. For individual events, book weeks to a month before. For bigger events, book several weeks to months before the trip. Want a cheaper option? Look for places on Airbnb. That can be a source of homier spaces at a more reasonable price. Or, find a suitable co-sharing space for business travelers. Yeah, you’ve heard this advice before. But it’s a cliche for a reason. Pack light enough and you avoid the risk of losing checked baggage. For short trips, try to fit everything in a carry-on. Instead of waiting to claim your luggage, you can head straight out post-flight. That can save you 30 minutes to two hours – time you can use to get to your accommodation early and relax. Take these top business travel packing tips with you on the road. This doesn’t mean you have to cook your own meals. Prepare a restaurant itinerary. Check online for the cleanest, most convenient places to eat. Online reviews will steer you in the right direction. If you’re bringing lunch to your client’s office, do some research online beforehand. That way you won’t have to figure things out as you go along. Remember that you’re still on your company’s time. You want to make the most of it. Know where the local hospital is at your destination. Chances are that you won’t need it. If you do, though, it helps if you know your options. Know the location of the closest pharmacy for emergency medicine runs. Even if you just need to restock on some Advil, it’s useful to know where you’re going. Also, find the nearest and most decent grocery or convenience store. It helps to know where to get essentials you may need, especially if you’re working late or are out late at an event. Call your HMO to make sure your health card works wherever you’re going. If you’re in a country where your insurance doesn’t work, ask for guidance on what to do in case of emergency. The day or hour before your meeting is not the time to be experimenting with foreign cuisine. You’ll never know how your body will react. Dealing with indigestion or bloating in a client meeting is never a pleasurable experience. It can even mess up your chances of clinching whatever deal you came there to clinch. Read a book or watch a movie. To help you pass the time during long flights, bring a few paperbacks or maybe some light books and magazines. A TV series or some movies to watch on your iPad or Kindle are a good idea, too. You can also download ebooks and podcasts to keep you busy and engaged while traveling. Take a nap. A long flight can also be an excuse to nap. Bring your comfy sleep gear, earplugs and eye mask. Of course, you can always ask for these from flight attendants but nothing spells comfort like having and using your own gear. If you’re comfortable enough wearing them in public, apply eye and face masks to include some skincare to your nap. Airplane travel, specifically low cabin humidity, can cause your skin to dry out, even oily skin to produce more excess oil. Frequent business trips can eventually take their toll. But someone has to do it. So while you’re at it, might as well be comfortable.